Flu is the condition we often tend to ignore and think it will simply pass by itself. In most cases that is true. The flu appears with its symptoms, tortures you for several days and leaves you crushed for a couple of more days before you fully recover. Still, there are other cases where flu poses a real threat for your health, and for your life, even. World Health Organization’s data show that the annual flu epidemic leads to about 3 to 5 cases of severe illness and 250 000 to 500 000 deaths. Failing to recognize if and when the flu becomes dangerous is what leads you to the danger of becoming a part of such statistics. Here are some things you must know in order to determine that. Certain populations are more at risk of experiencing severe illness, because of some issues with their immune systems. Children’s immune system, for instance is still underdeveloped. According to CDC, about 20 000 children under the age of five are hospitalized due to flu complications each year. Seniors also can suffer influenza-related complications because their immune systems are not able to effectively fight off the infection. Because of the changes to their immune systems, expecting mothers are more vulnerable to severe illness. Chronic medical condition and obesity are also risk factors. There are basically three types of flu: A, B and C. Types A and B are causes of the annual influenza epidemics affecting up to 20% of the population, while type C has less severe symptoms. Type A can infect animals (wild birds often act as a host for the virus), but it is most common in people. Type B can affect only humans. Type A viruses are the most dangerous ones, and it has been the cause of bird flu and swine flu pandemic. Because every year thousands of people die from complications occurred because of the seasonal flu, you should be alert for some signs that would mark the flu as dangerous. What starts a simple cough might have a much more unfortunate outcome. According to the experts from FrontlineER, those symptoms are different for adults and children. Because children are especially vulnerable, special attention should be directed to the warning signs which might require medical attention. Flu itself does not have to be dangerous, but it can cause some complications, especially for populations at more risk for serious effects. Children are at great risk for ear infections and neurological complication which can cause seizures. 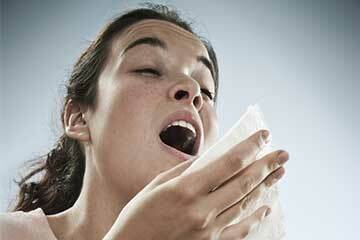 The flu can also directly attack sinuses or indirectly cause sinus infections. People with asthma can be even more sensitive to allergens and other asthma triggers, because of the influenza, which can lead to worsening their symptoms. The seniors (especially the ones living in nursing homes) are at risk for lung infection i.e. pneumonia. Pregnant women can experience respiratory infections which are linked with low birth weight and preterm birth. Francis Bacon was right when he said that knowledge is power. In this case it is what makes the difference between life and death. Knowing the warning signs of dangerous flu infection can actually be a lifesaver, so make sure you are well-informed, especially because this year’s season of flu has already started.